This week's Skywatch Friday photo was taken at Hancock Shaker Village, Hancock, Mass. The round building in the center is a multi-story round barn. Beautiful landscape and peaceful sky! Thank you for your visit, your kind words, and your greeting! The clouds and sky in your photo are very beautiful. Not to take away from its beauty, but it reminds me of the sky on that fateful day, 9/11/2001. 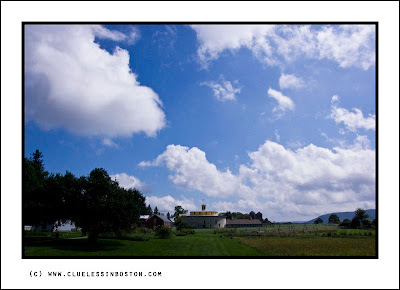 This is a perfect little shot with that round stone barn as an anchor for all that gorgeous sky. I love that barn. Such a beautiful structure. Visiting a Shaker villiage on a beautiful day - that's my idea of a perfect day! The round barn is fascinating. It looks like it is made from stone, locally gathered I hope. How old do you think it might be? It is always so nice to see the sky in a big angel, a round barn I have not seen that befor. Wow, beautiful colors. I love Massachusetts!! Beautiful shot and scene. I have never seen a round barn.